These stringers are designed for commercial use in cities, town, shopping, centers and commercial buildings. These Commercial Christmas lights are built to withstand the rigid demands of our commercial customers. 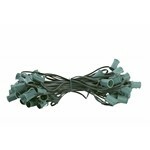 Built with 18 AWG, 10 AMP wire and featuring tough poly sockets with drainage holes. You won’t find a tougher stringer on the market.